My friend Brian’s book, Enter at A, Laughing, is a collection of humor essays about dressage (I’m not kidding—and it’s good, too) that includes the piece “The Gromit Test.” Gromit was Brian’s beloved golden retriever; the Gromit test was a measure of how well people got on with his dog. Whoever passed the test was guaranteed a place in heaven. 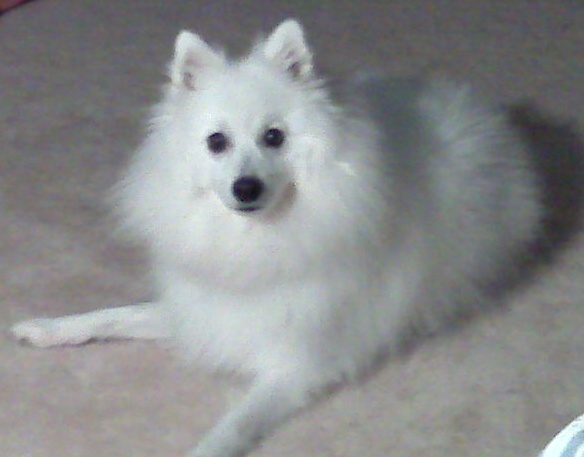 I have thought about Brian’s test many times since I got my Japanese Spitz two years ago. Most everyone is taken with Noshi (shortened from Tanoshii, which is Japanese for “fun”) as soon as they see him, because he is a fluffy, white ball of love, once you get past the vicious bark he greets you with. And just as Gromit served as a judge of mankind in general, Noshi serves as the arbiter of my boyfriends. Shortly after I got Noshi, I started seeing Jonathan, a sweet guy, if a bit empty-headed (more than a bit, if you must know). When he met Noshi, it was obvious that he was not a dog person; his natural response to my puppy’s movements was to withdraw. However, he had a strong desire to please me—and that’s not a bad thing—so he made an effort to like the dog. As I watched how he interacted with the animal, it was obvious that his affection was artificial. While he eagerly grabbed the leash and took Noshi out to do his business, his willingness and cheer were not convincing. Indeed, Noshi saw through it. One day when Jonathan had him outside, Noshi pulled out of his collar (his one trick). Jonathan, being a competitor in track in his college days, took off after him, chasing him into the thorny patch in the woods in my backyard, something no dog person would ever do (because we know, of course, that if you chase a dog, it will run away from you). But he was a fast enough runner that he managed to catch him. When he came into the house carrying Noshi, he showed me his own paw, and it was dripping with blood. He had grabbed Noshi by the tail and Noshi bit him—deservedly, I would say. I can retrieve anything short of a steak from my dog’s mouth without so much as a growl; Noshi is not a biter. Good call on Noshi’s part, I would say. When Bob came to the house, he greeted Noshi first—which is hard not to do when a barking fur ball is jumping all over you. Then he would spend the first several minutes—before he so much as chucked me on the shoulder—playing with him, or picking him up and nuzzling him. “Gee, you don’t greet me like you greet him,” I said one time, joking around. “Well you don’t greet me like he greets me!” he said. Bob definitely got bonus points in my book for how well he treated my dog. In the end, though, he did not turn in a passing grade. He broke up with me. Maybe a guy can get on too well with my dog, and I should have taken that greeting at the door for what it was: a tepid response to me, a passionate response to the pup. So lesson learned: love me, love my dog. Only…love me more.